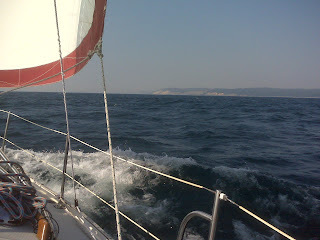 Sunday, 4:40 PM: Blue (our cruising spinnaker) was pulling us along nicely as the wind was building. We found we were doing sustained 7 knots and regularly surfing to near 8 when the helm began to feel over powered. We nearly averted a wipeout then decided to douse the chute (ballsy considering we're the only boat of two dozen not flying a spinnaker). We went with a reefed main and full genoa and could go nearly as deep and about the same speed. The wind continued to build so we reefed the genoa. We crash gybed to avoid two neck and neck spinnaker boats and ended up close to the Michigan shore near Sleeping Bear National Lakefront (see picture)..
We're now on a direct sail to South Manitou Island, 30 miles away. We lost a lot of time and know we're at the back of the fleet. Enthusiasm is turning to weariness but we continue to enjoy each other, Donnybrook, and Lake Michigan.